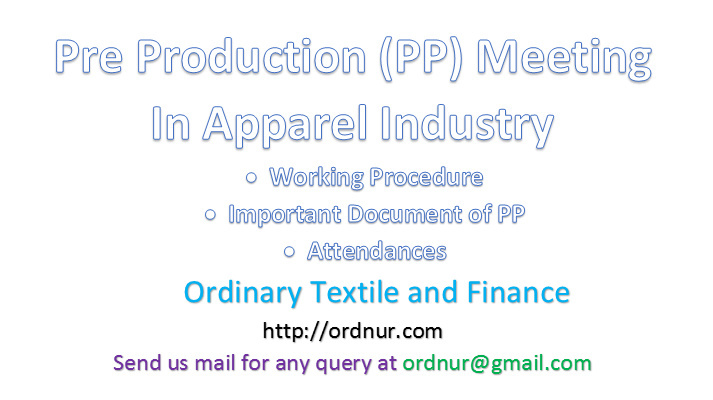 Pre-production meeting is known as PP meeting in Garments or Apparel industry. In a pre-production meeting discussion of every important issue related with bulk production is done, so that respected parties can ensure successful shipment of ordered goods. In a PP meeting what type of precautionary measures that need to be taken by the company is being set. Pre-production meeting is basically a meeting before starting bulk production, to set every parameter and core decision of production. This article is all about pre production meeting in apparel industry. Review PP sample/Size set sample/ 1st Production. Discussing all the process parameter of every section. Review all checklist of PP meeting. Giving special instruction for bulk production. Merchandiser confirms that all necessary items are already in housed for finished garments. Tagged Attendances of Parties in Pre Production Meeting, Important Documents to Present in PP Meeting, Important Documents to Present in Pre Production Meeting, Pre Production Meeting in Apparel Industry, Working Procedure of Pre Production Meeting.